Keep your puzzles together forever with this puzzle preserver from SunsOut! It's easy, just apply the glue to the front of the completed puzzle and let it dry. Includes enough glue for 2-3 puzzles. Contains 4 oz. of puzzle glue. Non-toxic, dries clear. Check out our How to Glue a Puzzle page. Easy to apply and am very happy with the results. I have used it on several projects. Do NOT however, purchase it on Amazon...it's about triple or more the price. Buy it here! I have not tried the glue yet. I will compare to others that I have used. Dries clear. Easy to use. I have tried other glue, but, this one is the best. Very easy to use with the brush. Dries crystal clear. Best glue to cover and keep a puzzle. Have had only the most outstanding results when using this glue. Easy to use and best of all it does actually work as stated. This came with a brush while other brands come with a stick. This is very easy to apply. Put on liberally like they say and puzzle is together nicely. Don't worry about the white color, it dries clear. Excellent product!!! Easy to use, works extremely well to hold puzzle together. The only glue i like to use. Love, love, love this glue!It is the only one I use. It goes on easy and holds strong. I highly recommend it. This glue is the best product on the market for puzzle's. I use it on every puzzle I have, without problems, and it dries clear. It has a great shine and dries quickly. I would use this on puzzles where you want a textured look and brush stroke look, because it has a texture when dry, giving a original brush stroked look. There may be some streaks and small bubbles on the surface of puzzle. Make sure this is the look you want. If you use your finger to smooth it out after brushed on it seals excellent. I do the backs as well for added strength. Works as advertised. Locks the puzzle and hold all the pieces in place. This is the best glue for your puzzles. I have tried others and the hold is not as good as this product. Very amazing how great the puzzle looks after it dries. I saw no evidence of glue remaining. I am excited to frame it. 4 Stars tammie baker - riverview, fl. good glue , worked after two layers. I really loved this puzzle glue. It went on white so it was easy to see where you already put it and it dried totally clear and my puzzle looks great!! I have already purchased 3 more jars for some upcoming puzzles I want to assemble and frame. Product is excellent and very easy to use ! A good product. Very easy to use. 5 Stars JAMES MCHUGH - HICKORY HILLS, IL. I HAVE BEEN USING THIS GLUE FOR YEARS AND I HAVE FOUND IT TO BE THE BEST PUZZLE GLUE BY FAR. PUZZLE WAREHOUSE SELLS THIS PRODUCT CHEAPER THAN OTHER JIG SAW PUZZLE COMPANIES. I LOVE THE PRODUCT AND ITS' FAIR PUZZLE WAREHOUSE PRICE. I used this on a 1000 piece puzzle that I was framing as a gift for a friend and it worked beautifully. There was enough product that I didn't feel I was skimping at the end, it dried clear and it dried quickly. 5 Stars Terry Lehman - New London,WI. This is the best puzzle glue I have ever used. Love it. I like this product, it works good for me, I tried others but was not pleased. This product works for happy puzzling. This puzzle glue is the best! It really gets the job done and isn't as messy as the other glues because it has that easy applicator brush. 5 Stars Gladys B - King George, VA. Purchased puzzle glue. Went on great, directions were good & it was easy to use. Results were wonderful. Thanks for the product so we could save & frame our grandson's puzzle of the Periodic Table! It took 3 months to complete. This is the best glue on the market. The blue color helps you to cover the entire puzzle without overdoing the glue application. 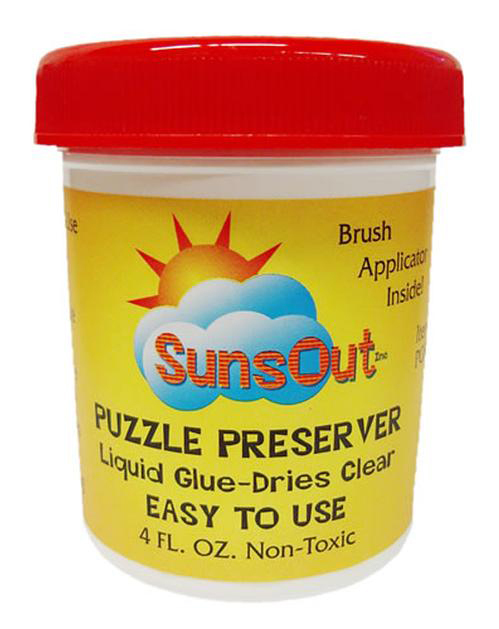 I HAVE BEEN USING YOUR SUNSET PUZZLE GLUE FOR YEARS AND IT IS THE BEST PUZZLE GLUE I HAVE FOUND. PLEASE KEEP IT IN YOUR COLLECTION OF PRODUCTS. THANK YOU. Allow extra drying time and be cafefull not to put it on to thick.. It Will Become Tacky. This is the best. Period. And you flat out cannot beat the price. Not to mention the fact that Puzzle Warehouse ALWAYS has it in stock. I buy puzzles for my father who is older and I probably buy somewhere between 20-25 brand-new puzzles every year. He has it in his head to permanently glue/seal each puzzle when he finishes. He swears by Sunsout brand glue. And it is not easy to find. For example, Amazon sometimes has it but it costs more and they often don't have more than a couple bottles on hand. Other retailers either don't have it or if they do charge double what Puzzle Warehouse does. As I am able to afford, I typically order 6 cans at a time and my dad usually gets (2) 1000-piece puzzles completely sealed (liberally) with this glue out of 1 can, so it goes a long way. It is easy to use. It is not messy. The lid/brush design is easy to use. What else is there to say? If you want to save your puzzles by gluing them this stuff is the best. After it dries (which doesn't take that long) it doesn't look like there's any glue on it, and yet you'd have to really work hard to try to break up a puzzle that was glued with this stuff. We typically roll out wax paper over the finished puzzle and place a large piece of foamboard that you can get a craft store or walmart or wherever, and then "flip" the puzzle over. Then glue real good, getting into all the nooks and crannies and being very generous with it but smoothing it out good. Go over every single inch of the back of your puzzle, smooth it out nice with the brush. Let it dry. My dad likes to do this at night before bed and in the morning its definitely dry for sure. Then we slide the foamboard out from underneath, put it on top, and "flip" it back over. Done! He also saves the fronts of the boxes. I don't understand his method in terms of logic - but it brings him a lot of joy, so who cares? Anyway, you just can't beat this stuff! That's my two cents. This was my first foray into preserving a puzzle and it was a breeze. I used this on a SunsOut puzzle and they played nicely together! I also mounted the finished puzzle on a piece of foam core which made a nice finished product for framing or whatever. I would recommend giving this a try if you have been tempted to preserve your puzzle. This is the only puzzle glue I would use. I like that it is a different color so you can make sure you the puzzle is covered. Love SunsOut puzzle glue. Am confidant in using it on my expensive James Christensen Puzzles!!! This stuff works great! Instead of using the brush, I poured it onto the puzzle and spread it around with a piece of cardboard. I used the brush for the edges. Very happy with the results! Was a breeze..got at least 3 large puzzles with some left over..one coat was plenty for framing..
Glad I found this product. Awesome!! Great way to preserve puzzles. This is the best glue ever!!!!! 5 Stars Elizabeth D - Troy, N.Y. I have used this on 5 out of 6 of my puzzles that I am planning to turn into pictures....it works great! The pieces stick together nicely and makes the puzzles look fantastic! This is the best glue ever. Have used many different kind plus tried some homemade and nothing compares to Sunsout Puzzle Preserver. Highly suggest using this. I have ordered three of these. So far so good. Application is easy. Brush is ok, but I supplement it with a sturdy I have used it in at least three different brands with no problem. Price may be a little too high for glue, but I would rather use this than the alternatives in the market. I will buy again and will recommend to other jigsaw puzzle enthusiasts. Our first use was a success. We will be using this product again. There's no better way to preserve your hard work! I glue both the front and the back of a puzzle and this works so well and leaves the picture with beautiful color tones. Best puzzle glue we have ever used! Best puzzle glue I've used. Dries clear and has a brush. Love it!! 5 Stars karen l - chino, calif.
Have not used it yet but I am sure it will work well. I love using the glue on my finished puzzles. I like the finish it leaves and the way it brightens or brings out the colors in them. After I have spent my time to complete a puzzle I like to have it preserved. The glue does a wonderful job of that. Thanks! 5 Stars JAMES M - HICKORY HILLS, IL. I LOVE THIS GLUE BECAUSE IT IS CLEAR AND IT ADHERES TO THE THIN CARDBOARD THAT THE PUZZLE IS PUT TOGETHER ON. I CAN TRANSPORT THE PUZZLE THEN IF I SO CHOOSE. I OFTEN WITH DOUBLE SIDED TAPE HANG THEM IN MY GARAGE JUST TO BRIGHTEN UP ITS' WALLS. ALSO, YOUR PRICE IS A DOLLAR CHEAPER THAN ANOTHER PUZZLE COMPANY WITH SUNSOUT GLUE. GREAT GLUE. I ALSO LOVE YOUR PUZZLES. haven't used it yet, price was good, not so thrilled with shipping charges but otherwise good. Love the product...worked great on my butterfly shaped puzzle. This glue was just the right amount to lightly cover a 2000 piece puzzle. At first I thought I would run out, but I used sparingly and it just worked out to be enough. It dried nicely. THIS IS THE BEST GLUE FOR PRESERVING PUZZLES. PLEASE, DON'T DISCONTINUE IT. this item worked great, since this was the 1st time i mounted a puzzle, i thought the item di a fantastic job. 5 Stars Ronald Tolson - Strawberry Plains Tn. This was the best puzzle that I have ever put together. You sent it in a timely fashion and I received it very quickly, in perfect order. Thank you and I will be ordering more. I really like this product. I learned that if I coated the puzzle, let it dry completely, then coated it again, I can actually pick up the puzzle and move it. Since yes, the puzzle will stick to paper beneath it, I suggest putting it on the mounting board before using glue. Works like a charm!!!!!!! lOVED THE PUZZLE AND THE GLUE IS FANTASTIC. OUR PUZZLES ARE IN BEING FRAMED RIGHT NOW. 5 Stars P. Horban - Langley, B.C. I ordered 2. 1of them came opened and spilled out of the bag. - From Puzzle Warehouse: We were able to send out another bottle of Puzzle Preserver to Shirl at no additional charge. I've worked with a few different brands of puzzle glue, and I'm not that fond of this product, Sunsout. It's too liquidity ..too drippy . .needs to be thickened up. I completely covered two large puzzles so far with 4 oz. of puzzle glue. Looks like I will be able to cover one more large puzzle. Easy to use and dries quickly and clearly on the puzzle. This is the best glue I have found for preserving a puzzle. I have tried different ones over the years, but none cover so well and so clear! Thanks again for another great product! This product is a good top coat preserver. However, you will need some other glue product to hold the puzzle together.